Hutcheson Sand & Mixes located in Huntsville Ontario and has been serving the golf course industry for over 30 years, providing people with innovative solutions to their sand needs. From topdressing sands to bunker sands and divot mixes to other specialty sands, our products can be found on golf courses across Canada and the United States. At Hutcheson Sand & Mixes, we take great pride in producing rootzone and topdressing materials. Meticulous attention to detail is given to correct particle sizing and proper blending to ensure the highest quality for the demanding needs of the golf course industry. 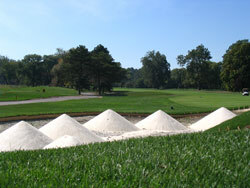 Hutcheson Sand & Mixes has worked diligently with laboratories, architects and golf course superintendents alike, to produce approximately 60 products to service this industry. From our Huntsville location, we can produce chemically balanced non-calcareous sands and mixes. Hutcheson non-calcareous products are preferred by golf course superintendents and grounds managers around the world. We have partnered with other aggregate producers in Southwestern and Central Ontario to produce calcareous sands and mixes. The flexibility to transport our blending equipment combined with our expertise has allowed us to produce sand and mixes from across Canada. Our goal is to continue to develop the best products for the specific needs for turf grass industry.